<!-Eric Gill. 1882-1940--> Eric Gill. 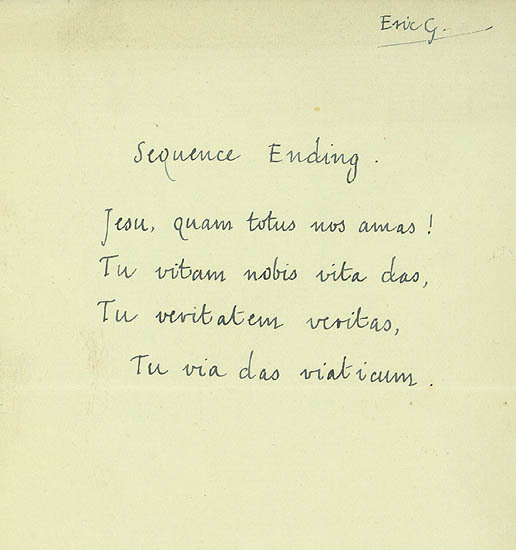 Sequence Ending:/Jesu, quam totus nos amas!/ Tu vitam nobis vita das,/ Tu veritatem veritas/ Tu via das viaticum. Jesu, quam totus nos amas! Tu veritatem veritas/ Tu via das viaticum. Ink on 'Arch[es]' countermarked paper. 1 7/8 x 2 3/4 (sheet 6 x 4 7/16). Signed in ink, upper right. Unpublished original work. $1,250.